Three years ago, just a month after moving here, we took our kids trick-or-treating. I'm not sure if it's living in a big city, or trick-or-treating in neighborhoods with too much money, or just the Hollywood influence ... but it was unlike anything we had experienced. Friends of ours recommended a "popular" neighborhood here on the westside. That was an understatement: there were so many kids and parents at times it was hard to walk on the sidewalks - it was that crowded. Is it just being a dad of young kids, or are costumes creepier than in the past? Some houses looked like professionally designed sets to horror films. Gone are the days of a couple of pumpkins and "Casper the Friendly Ghost" in the front yard. Neighbors seem to compete with each other on who has most terrifying and realistic house. Does anyone else have a problem with young children being shown images of death, torture and the occult? What's really scary is when we as adults start to get used to this - and it no longer shocks. I mentioned this to a friend in our community, who shared how busy his street is as well. I asked him if he'd like to work together to create an "alternative" Halloween celebration. Thus was born "Light Up the Night." I'm sure the name isn't original with us - but we like it. No, this is not Disneyland - just the driveway of our friends' home. At the busiest time there were sixty kids and parents hanging out. Another view when things mellowed out a bit. Helium balloons that said "Light Up the Night" were a huge hit - we ran out. Friends from our church help make this happen. A couple of guys involved in the entertainment industry set up live video feed this year - so kids could "be on TV." Fun. It's also something kids from our church can be involved with: handing out balloons, candy, or running the puppet theater. I heard some adults refer to it as "that Christian house." That's great. 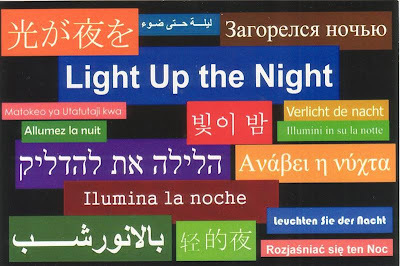 This year we created 4x6 cards with "Light Up the Night" in multiple languages. The back had a bit of information about the event and our church's website. Last year a dad told me "people all over are talking about this house. People in Santa Monica, Brentwood ... I'm here because a friend at work said 'you gotta see this one house ....'" We can't verify if that's true, but every year we get great feedback from appreciative parents, the majority whom have no religious background. Before moving to Los Angeles, we lived in Tempe, Arizona. Our church there had a HUGE Halloween event at the church, attracting thousands of people every year. The year we moved the church canceled the event. Why? Because it was attracting thousands of Christians. The church challenged small groups to work to impact individual communities and neighborhoods. 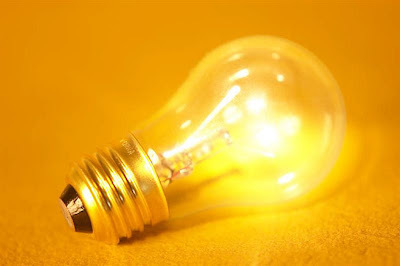 Something, I like to think, like "Light Up the Night." We had a blast hosting this event. And it's not just an "L.A. thing" - let us know, we'd be glad to pass along thoughts and ideas if this is something you'd like to try in your community.